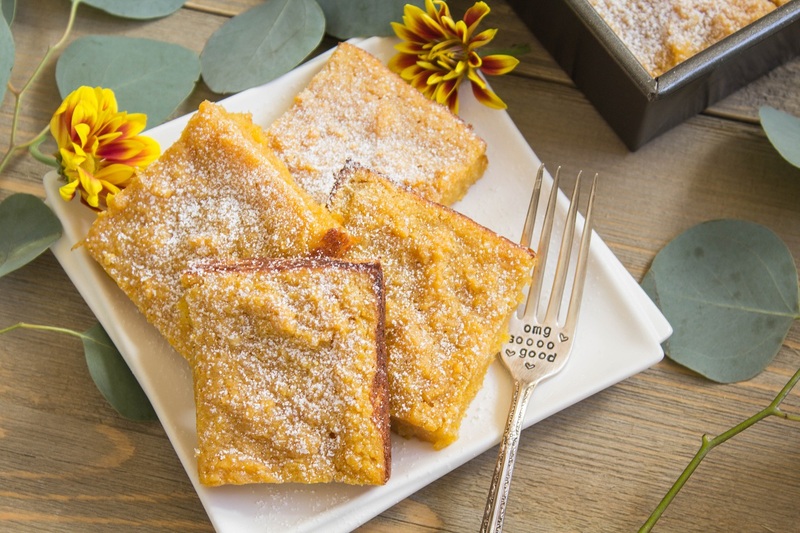 Custard like cassava cake filled with pumpkin and maple in each bite. 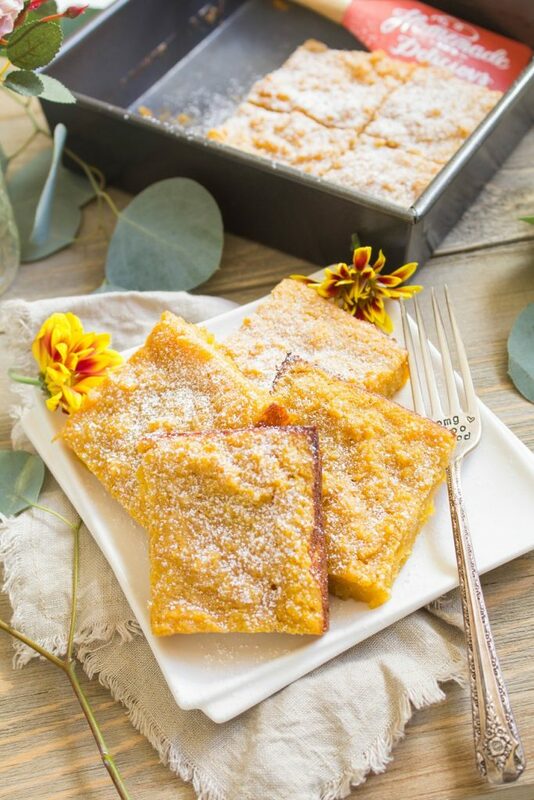 This pumpkin maple cassava cake is delicious, simple to make, and perfect for fall. We’re in the middle of another heat wave in San Francisco, and it has been absolutely difficult to cook. Just imagine unusually hot weather outside, no air conditioning whatsoever in the house, and the oven is running at 400F. So totally comfortable, right? 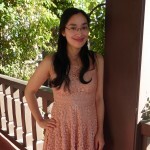 I’ve been working so much more lately, and it’s been hard balancing both work and cooking for the blog. But hopefully I’m back on track now because I seriously love fall, and I have so many things I want to make and share. So today, I wanted to start with pumpkin maple cassava cake. Have you ever had cassava cake? It’s really common as a Vietnamese or Filipino dessert. I made the original version a few years ago, you can find the recipe for cassava cake here. What I love most about cassava cake is that the edges and top is caramelized and the center is soft and custard like. And since a batch makes nine pieces, only one piece is missing that caramelized edge that I love so much. So today, I wanted to share with you an updated fall inspired version. Each bite of this cassava cake is filled with pumpkin and maple. It’s a simple dessert to make, and it’s gluten free since there’s no flour in the ingredients. 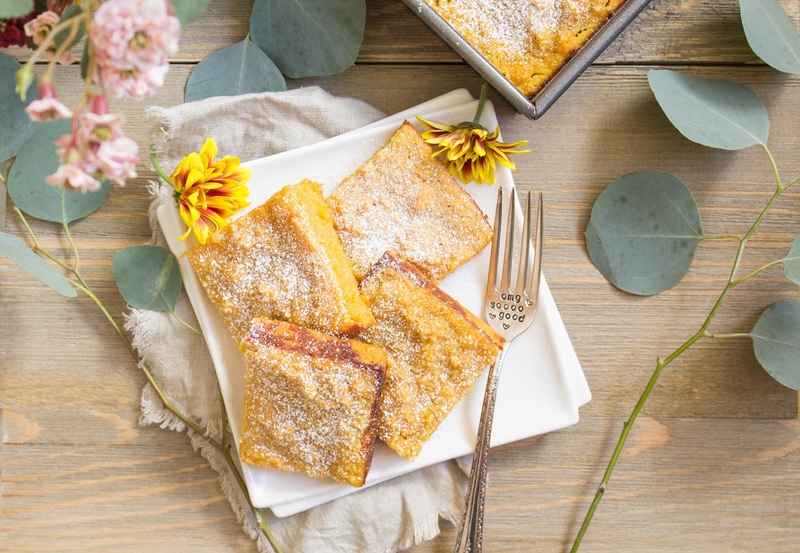 You’ll want to give this dessert a try. Preheat the oven to 400F. 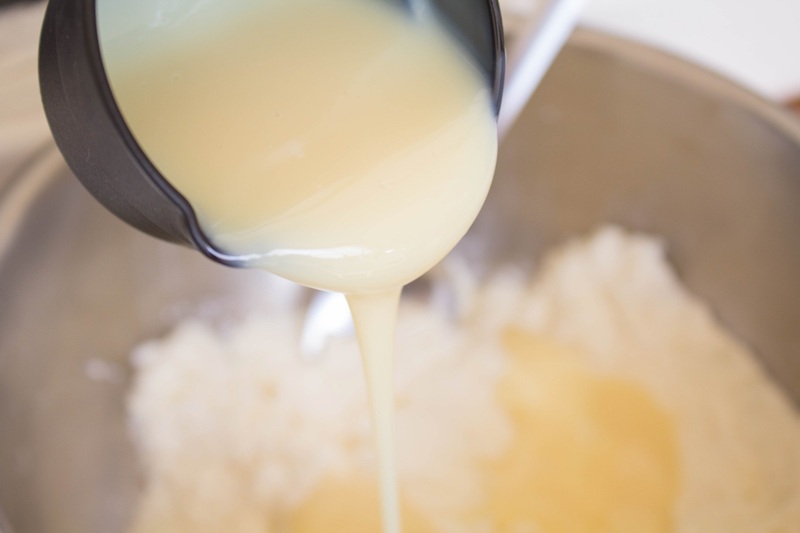 Lightly grease a 9×9 inch baking pan with nonstick cooking spray or olive oil. Set the pan aside for now. 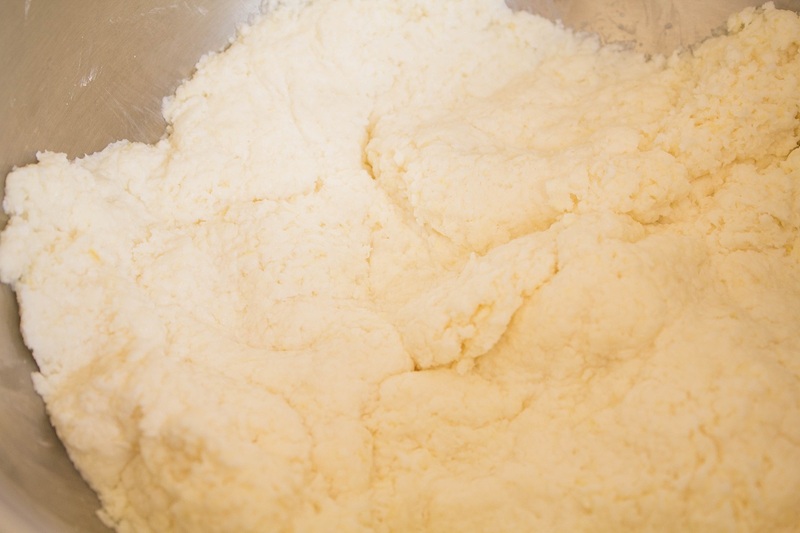 In a medium sized mixing bowl, add defrosted grated cassava. You can find these at your local Asian supermarket in the frozen section. 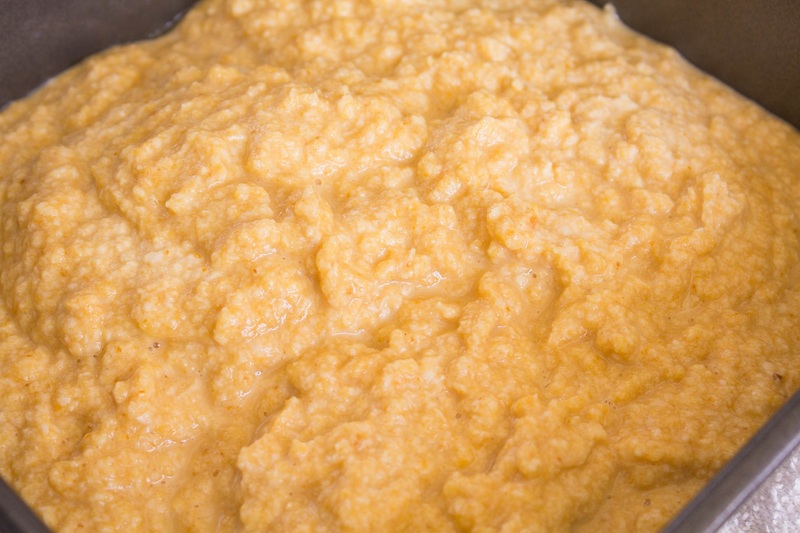 Use a paper towel to pat the grated cassava to drain as much of the water out as possible. The less water remaining in the cassava, the more chewy it’ll be. Next, add condensed milk, granulated sugar, egg, pumpkin puree, vanilla extract, and maple syrup. Mix all the ingredients together until well combined. 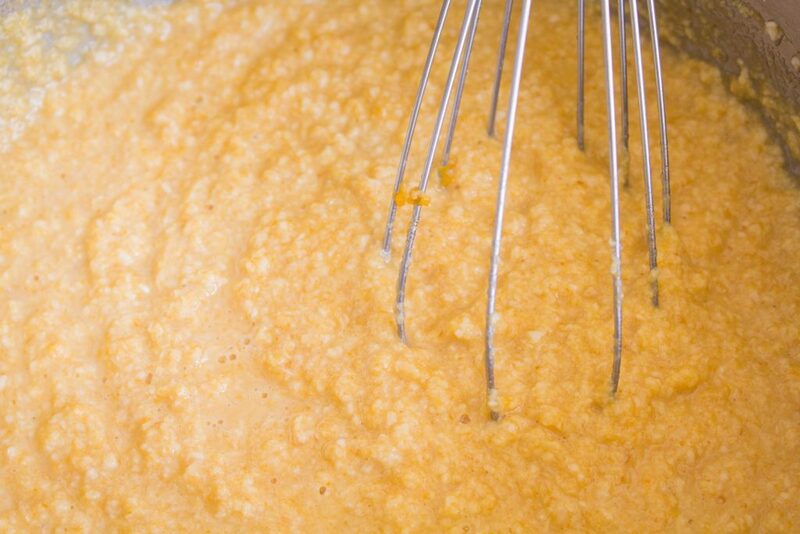 The batter will look grainy. Pour the batter into the prepared baking pan. 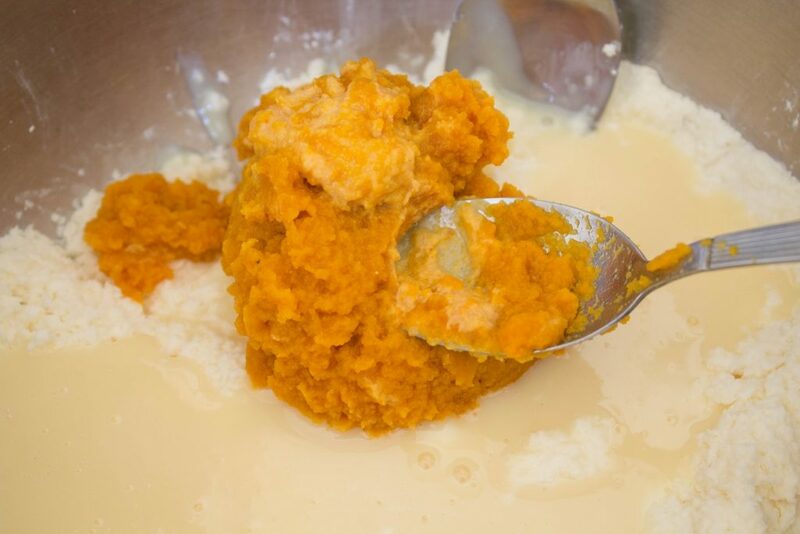 Bake the pumpkin maple cassava cake for about 35 minutes until the edges are browned. Insert a toothpick through the center. If it comes out clean, the cake is ready. If the top isn’t as brown and caramelized, place the cassava cake in the oven under the broiler setting for a couple minutes. 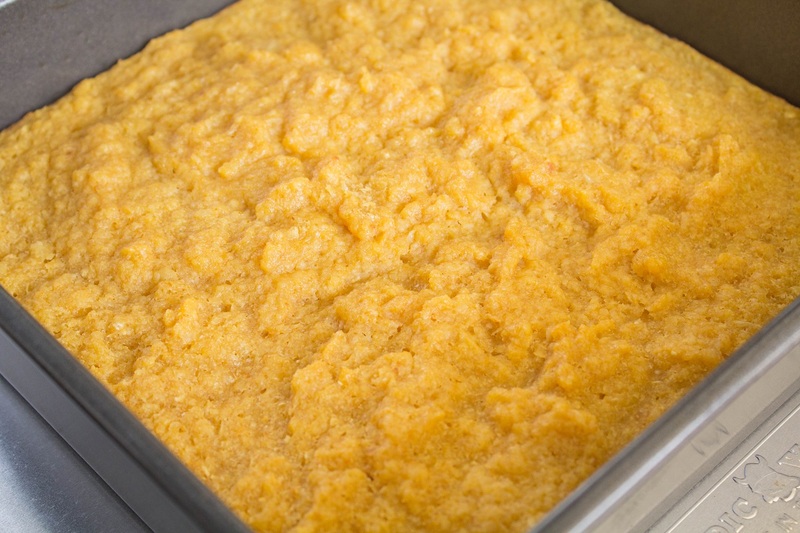 Remove the pumpkin maple cassava cake from the oven and allow it to cool for several minutes to set. Cutting into the cake too soon will make the cake stick to the knife. 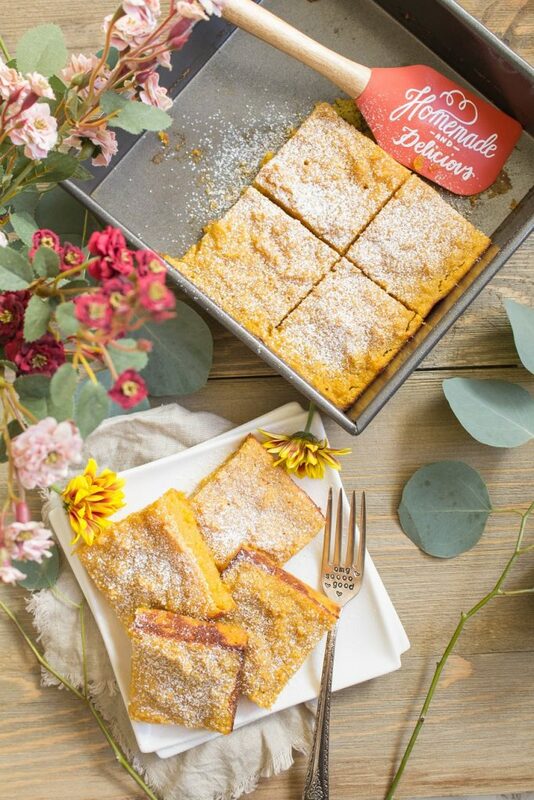 Once the pumpkin maple cassava cake has cooled, cut into nine slices. Served the pumpkin maple cassava cake lightly dusted with powdered sugar. Preheat the oven to 400F. Lightly grease a 9x9 inch baking pan with nonstick cooking spray or olive oil. Set the pan aside for now. In a medium sized mixing bowl, add defrosted grated cassava. Use a paper towel to pat the grated cassava to absorb as much of the water out as possible. The less water remaining in the cassava, the more chewy it’ll be. Pour the batter into the prepared baking pan. Bake the pumpkin maple cassava cake for about 35-40 minutes until the edges are browned. Insert a toothpick through the center. If it comes out clean, the cake is ready. If the top isn’t as brown and caramelized, place the cassava cake in the oven under the broiler setting for a couple minutes. 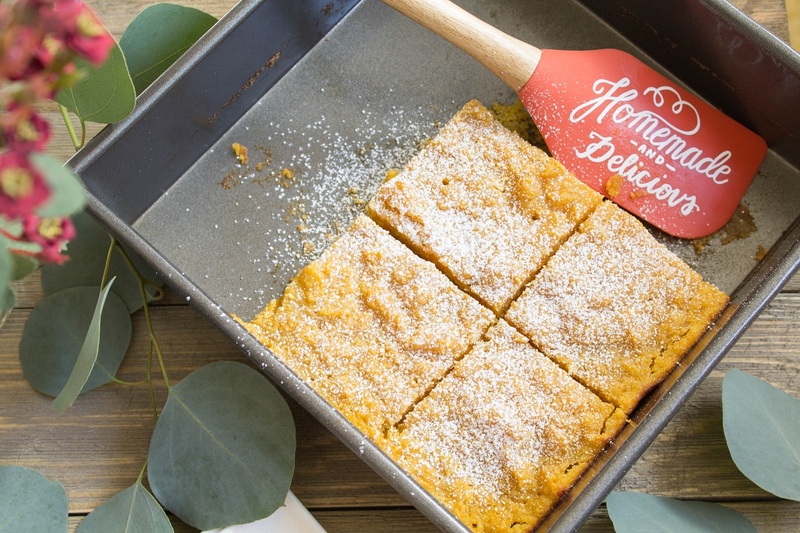 Remove the pumpkin maple cassava cake from the oven and allow it to cool for several minutes to set. Cutting into the cake too soon will make the cake stick to the knife and fall apart. 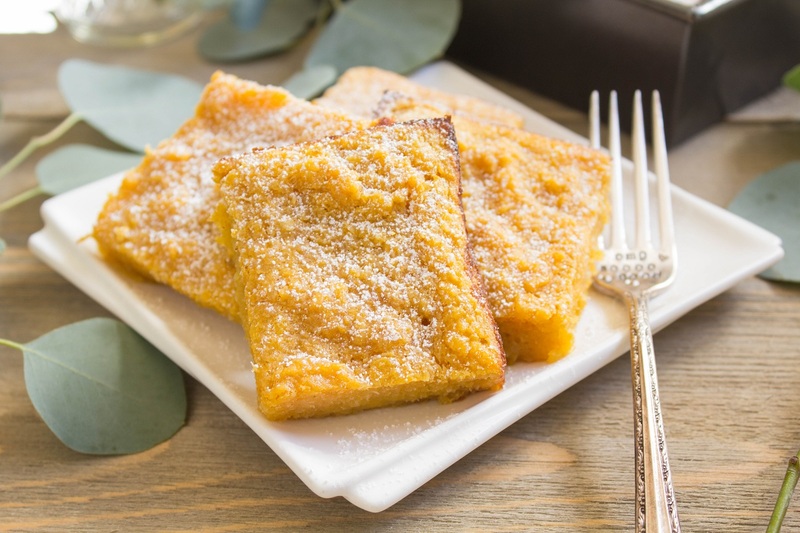 Once the pumpkin maple cassava cake has cooled, cut into nine slices. 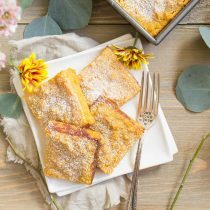 This entry was posted in Asian Inspired, Desserts, Fall Cravings, Gluten Free, Quick and Easy, Recipes, Vegetarian and tagged dessert, fall recipes, gluten free, pumpkin, quick and easy, vegetarian. I actually bought a package of frozen grated cassava. I definitely would not want to grate frozen cassava. That would be a pain! I haven’t tried thawing frozen cassava and putting it in a food processor. But you could try that and let me know how it turns out. Or you could try it with fresh cassava. That looks so delicious. We have so much cassava in Paraguay. I’ve been wanting to make something sweet with it. I’ll give your recipe a try. I hope you’ll like it, Lizet!